Cetol Maintenance is a premium, transparent exterior satin finish that can only be applied over a previously coated Cetol system, as a maintenance coat. Wood will then preserve its appearance and color. 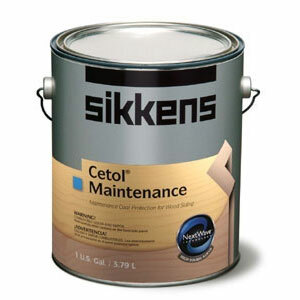 • Non-pigmented (colorless) maintenance coating: Prevents the wood color from darkening after several maintenance coats. Can only be applied over a previously coated Cetol 23 Plus or Cetol Log & Siding system where the surface is in good condition and has been maintained according to Sikkens guidelines. • High solids alkyd:Provides maintenance protection in one coat. • Excellent microporosity and flexibility:Minimizes blistering and cracking due to expansion and contraction or moisture build-up.